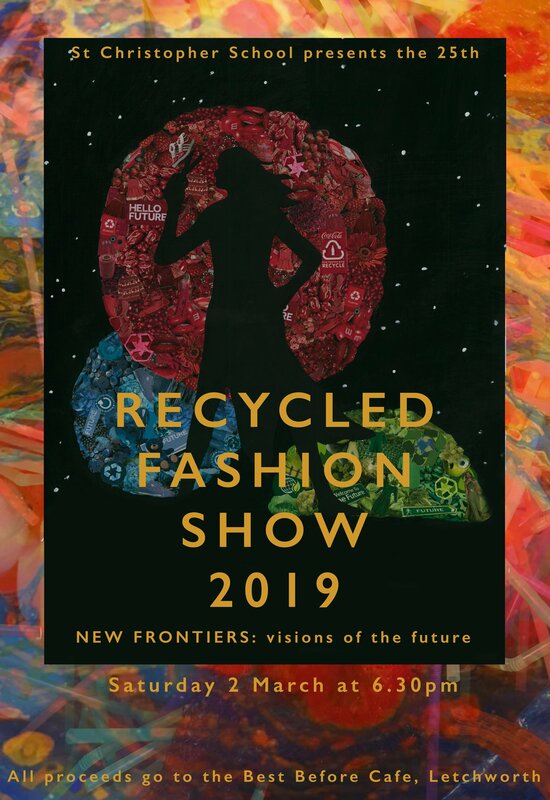 Tickets are now available for the St Chris Recycled Fashion Show 2019! The 25th annual show takes place on Saturday 2 March at 6.30pm. The catwalk show features over 70 costumes designed, made and modelled by students from schools across Hertfordshire. The theme for this year’s show is New Frontiers: Visions of the Future. Tickets cost £6 and all proceeds from this year’s show will go to Letchworth’s Best Before Cafe. Please click here to visit Eventbrite for tickets. Following the catwalk show, over 30 of the best costumes will be displayed in an exhibition at the Letchworth Community Museum. The exhibition will open with a private view on Friday 8 March and will be open to the public on Saturday 9 and Sunday 10 March, and then from Thursday 14 to Sunday 17 March from 10am to 5pm.